South Carolina was the first state to secede from the Union in December, 1860 and was one of the founding members of the Confederacy (February, 1861). The bombardment of the beleaguered U.S. garrison at Fort Sumter in Charleston harbor on April 12, 1861 is recognized as first military engagement of the war. South Carolina was a source of troops for the Confederate army, and as the war progressed, also for the Union, as thousands of ex-slaves flocked to join the Union forces. The state also provided uniforms, textiles, food, and war material, as well as trained soldiers and leaders from The Citadel and other military schools. In contrast to most other Confederate states, South Carolina had a well-developed rail network linking all of its major cities. Relatively free from Union occupation until the very end of the war, South Carolina hosted a number of prisoner of war camps. South Carolina was also the only Confederate state not to harbor pockets of anti-secessionist that were strong enough to send large amounts of white men to fight for the Union, as every other state in the Confederacy did. Despite South Carolina’s important role in the start of the war, and a long unsuccessful attempt to take Charleston from 1863 onward, few military engagements occurred within the state’s borders until 1865, when Sherman’s Army, having already completed its March to the Sea in Savannah, marched to Columbia and leveled most of the town, as well as a number of towns along the way and afterward. South Carolina lost 12,922 men to the war, 23% of its male white population of fighting age, and the highest percentage of any state in the nation. Sherman’s 1865 march through the Carolinas resulted in the burning of Columbia and numerous other towns. The destruction his troops wrought upon South Carolina was even worse than in Georgia, because many of his men bore a particular grudge against the state and its citizens, who they blamed for starting the war. One of Sherman’s men declared, “Here is where treason began and, by God, here is where it shall end!” Poverty would mark the state for generations to come. Fort Sumter (April 12-14, 1861) – Part of the Operations in Charleston Harbor campaign, this battle took place in Charleston County. On April 10, 1861, Brigadier General Beauregard, in command of the provisional Confederate forces at Charleston, South Carolina, demanded the surrender of the Union garrison of Fort Sumter in Charleston Harbor. Garrison commander Anderson refused. On April 12, Confederate batteries opened fire on the fort, which was unable to reply effectively. At 2:30 pm on April 13, Major Anderson surrendered Fort Sumter, evacuating the garrison on the following day. The bombardment of Fort Sumter was the opening engagement of the Civil War. Although there were no casualties during the bombardment, one Union artillerist was killed and three wounded (one mortally) when a cannon exploded prematurely while firing a salute during the evacuation on April 14th. Secessionville (June 16, 1862) – Also known as the Battle of Fort Lamar and the Battle of James Island, this skirmish was part of the Operations against Charleston campaign. In early June, 1862, Major General David Hunter transported Horatio G. Wright’s and Isaac I. Stevens’s Union divisions under immediate direction of Brigadier General Henry Benham to James Island where they entrenched at Grimball’s Landing near the southern flank of the Confederate defenses. On June 16th, contrary to Hunter’s orders, Benham launched an unsuccessful frontal assault against Fort Lamar at Secessionville. Because Benham was said to have disobeyed orders, Hunter relieved him of command. The Confederate victory resulted in estimated casualties of 685 Union and 204 Confederate. Simmon’s Bluff (June 21, 1862) – In June, the Federals besieging Charleston mounted an amphibious expedition to cut the Charleston & Savannah Railroad. On June 21st, troops of the 55th Pennsylvania landed from the gunboat Crusader and transport Planter near Simmon’s Bluff on Wadmelaw Sound, surprising and burning an encampment of the 16th South Carolina Infantry. The Confederates scattered, and the Federals returned to their ships. Despite this minor victory, the Federals abandoned their raid on the railroad. Although a bloodless raid, this engagement typified scores of similar encounters that occurred along the South Carolina coastline. The Union victory resulted in no casualties. Charleston Harbor (April 7, 1863) – Also called Fort Sumter, this skirmish was part of the Operations against Defenses of Charleston. 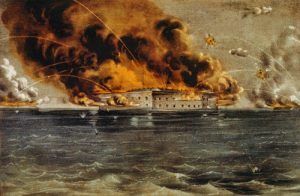 In April, Major General David Hunter prepared his land forces on Folly, Cole’s, and North Edisto Islands to cooperate with a naval bombardment of Fort Sumter. On April 7, the South Atlantic Squadron under Rear Admiral S.F. Du Pont bombarded Fort Sumter, having little impact on the Confederate defenses of Charleston Harbor. Although several of Hunter’s units had embarked on transports, the infantry were not landed, and the joint operation was abandoned. The ironclad warships Keokuk, Weehawken, Passaic, Montauk, Patapsco, New Ironsides, Catskill, Nantucket, and Nahant participated in the bombardment. Keokuk, struck more than 90 times by the accurate Confederate fire, sunk the next day. With the warships repulsed the skirmish was a Confederate victory, with 22 Union casualties and 14 Confederate. 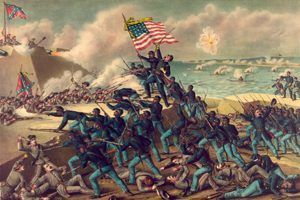 Fort Wagner (July 10-11, 1863) – Also known as the First Assault and the Battle of Morris Island, this skirmish was part of the Operations against Defenses of Charleston campaign. On July 10, Union artillery on Folly Island together with Rear Admiral John Dahlgren’s fleet of ironclads opened fire on Confederate defenses of Morris Island. The bombardment provided cover for Brigadier General George C. Strong’s brigade, which crossed Light House Inlet and landed by boats on the southern tip of the island. Strong’s troops advanced, capturing several batteries, to within range of Confederate Fort Wagner. At dawn, July 11, Strong attacked the fort. Soldiers of the 7th Connecticut reached the parapet but, unsupported, were thrown back. Estimated casualties in the Confederate victory were 339 Union and 12 Confederate. Grimball’s Landing (July 16, 1863) – Also known as the Battle of Secessionville or the Battle of James Island this skirmish was part of the Operations against Defenses of Charleston campaign. To divert Confederate reinforcements from a renewed attack on Fort Wagner, General Quincy Gillmore designed two feints. An amphibious force ascended Stono River to threaten the Charleston & Savannah Railroad bridge. A second force, consisting of Brigadier General Alfred Terry’s division, landed on James Island on July 8th. Terry demonstrated against the Confederate defenses. On July 16, the Confederates attacked Terry’s camp at Grimball’s Landing. Because of incomplete reconnaissance of the difficult, marshy ground, the disorganized Confederate attack was soon aborted. Their mission accomplished, Federal troops withdrew from the island on July 17th. The inconclusive battle resulted in an unknown number of Union casualties and an estimated 18 Confederate. Fort Wagner/Morris Island (July 18-September 7, 1863) – Also known as the Second Assault, this battle was part of the Operations against Defenses of Charleston campaign. After the July 11th assault on Fort Wagner failed, Major General Quincy Gillmore reinforced his beachhead on Morris Island. At dusk on July 18th, Gillmore launched an attack spearheaded by the 54th Massachusetts Infantry, a black regiment. The unit’s colonel, Robert Gould Shaw, was killed. Members of the brigade scaled the parapet but after brutal hand-to-hand combat were driven out with heavy casualties. The Federals resorted to siege operations to reduce the fort. This was the fourth time in the war that black troops played a crucial combat role, proving to skeptics that they would fight bravely if only given the chance. The Confederate victory resulted in 1515 Union casualties and 174 Confederate. 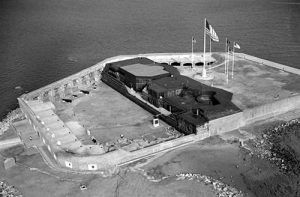 Fort Sumter (August 17-December 31, 1863) – Also referred to as the Battle of Charleston Harbor and the Battle of Morris Island, this skirmish was part of the Operations against Defenses of Charleston campaign. 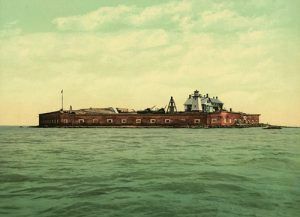 Federal batteries erected on Morris Island opened fire on August 17 and continued their bombardment of Fort Sumter and the Charleston defenses until August 23. Despite a severe pounding, Fort Sumter’s garrison held out. Siege operations continued against Fort Wagner on Morris Island. The number of casualties in the inconclusive battle are unknown. Charleston Harbor (September 7-8, 1863) – Also called The Battle of Battery Gregg, Fort Wagner, Morris Island, and Fort Sumter, this skirmish was part of the Operations against Defenses of Charleston. During the night of September 6-7, Confederate forces evacuated Fort Wagner and Battery Gregg pressured by advancing Federal siegeworks. Federal troops then occupied all of Morris Island. On September 8th, a storming party of about 400 marines and sailors attempted to surprise Fort Sumter. The attack was repulsed. The Confederate victory resulted in 117 Union casualties. The number of Confederate casualties is unknown. Honey Hill (November 30, 1864) – Taking place in Jasper County, this battle was part of the Savannah Campaign. Leaving Hilton Head on November 28th, a Union expeditionary force under Major General John P. Hatch steamed up the Broad River in transports to cut the Charleston & Savannah Railroad near Pocotaligo. Hatch disembarked at Boyd’s Landing and marched inland. On November 30, Hatch encountered a Confederate force of regulars and militia under Colonel Charles J. Colcock at Honey Hill. Determined attacks by U.S. Colored Troops (including the 54th Massachusetts) failed to capture the Confederate entrenchments or cut the railroad. Hatch retired after dark, withdrawing to his transports at Boyd’s Neck. The Confederate victory resulted in estimated casualties of 746 Union and 60 Confederate. Rivers’ Bridge (February 3, 1865) – Part of the Campaign of the Carolinas, this skirmish which took place in Bamberg County was known by several other names including the Battle of Salkehatchie River, Hickory Hill, Owens’ Cross Roads, Lawtonville, and Duck Creek. On February 2, 1865, a Confederate force under Major General Lafayette McLaws held the crossings of the Salkehatchie River against the advance of the right wing of Sherman’s Army. Federal soldiers began building bridges across the swamp to bypass the road block. In the meantime, Union columns worked to get on the Confederates’ flanks and rear. On February 3rd, two Union brigades waded the swamp downstream and assaulted McLaws’s right. McLaws retreated toward Branchville after stalling Sherman’s advance for only one day. The Union victory resulted in estimated loosed of 92 Union and 170 Confederate. Compiled and edited by Kathy Weiser/Legends of America, January, 2017.